In order to support rapid growth, Skechers had to achieve the goal of timely availability of critical business information and integration with existing processes. The company has offices across the US and Europe and integrated financial reporting was critical. Skechers had Peoplesoft hosted in their in-house data centers and managed by their internal IT organization. 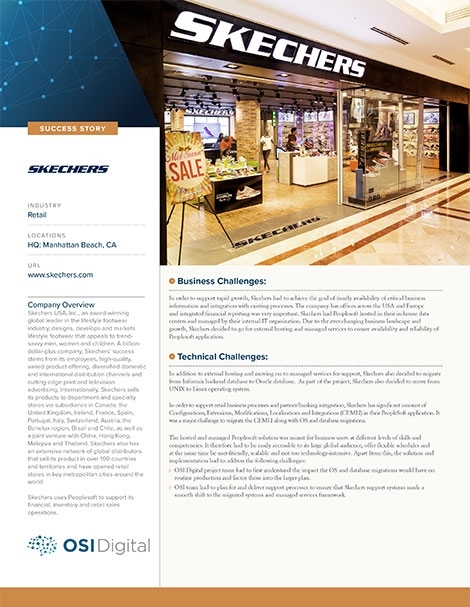 Due to the ever-changing business landscape and growth, Skechers decided to proceed with external hosting and managed services to ensure the availability and reliability of the Peoplesoft application. The OSI Digital team was comprised of a program manager, database administrator, system administrator and software architects. OSI used a phased approach to achieve the objectives of OS, database and service migrations for the customer. As part of the discovery phase, the OSI team conducted an inventory of all infrastructure, database and applications. The team then developed the architecture and design of the new setup and conducted the required end-user testing and gap analysis. Another key element of the solution was implementing and testing a high availability Disaster Recovery solution, migration of non-production and production infrastructure, testing by power users, and finally, handing off support of new infrastructure to the managed services group. In order to support rapid growth, Skechers engaged OSI to achieve the goal of accessing critical business information quickly and integrating the data with existing processes.